France had quite a few of its own items, but not nearly on the scale of Japan or the UK. Other countries also got a hold of the items as people shared and mailed things around. Some of these items may turn up in other Europe areas, but if it's generally considered to have originated in France, you can find it here. They were fairly good about them too, and made enough so that you will still encounter a few for sale. The quality was decent as well, so broken things are not common. How's this for a 20th anniversary item? A jar of Sonic Anti-Aging cream! Clearly a limited edition item, this little jar of cream comes in a fancy paper certificate/box. 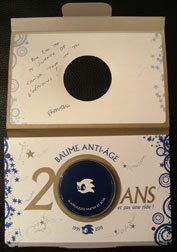 It says "Baume Anti Age 20 Ans Et Pas Une Ride" It has the SonicTeam logo Sonic head, and 1991 - 2011 below it. Someone has written a note on the top flap, which is in French so you can't read it. The bottom word, however, is "forever". 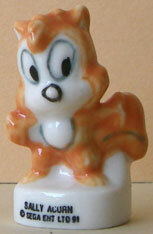 In all, it is a wonderful presentation for the cream, and CERTAINLY a very unusual item to collect. If you can manage to get this, it's sure to be a star in any collection. Photo discovered by SonicToast. Here are two more feves, Tails & a Flicky bird. 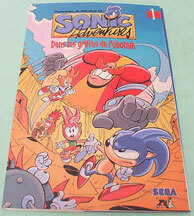 Tails isn't the best either, with red legs, no socks, and just shoes. He's also rather fat...but it's the super big nose face and small ears that make him almost unrecognizable. If it weren't for his 2 tails he could just be some generic animal figure. The Flicky bird is better off...but early flickies are generally depicted as being blue (with red accent beside the eye) however this one appears to be reddish or brownish all-over. (Getting a figure entirely the wrong color hadn't happened up till this one) but, at least the proportions here are a bit better. Do you have a photo that's a bit less blurry? Now here's a very curious item! Then, along came Archie Comics, and took hold of this re-named background character, changed the design completely, hacked off the tail, and called it "Sally Acorn" as well, though she even stopped being a squirrel. Naturally this figure would cause a lot of confusion! 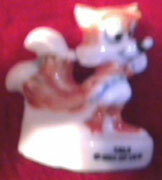 The other question remains: were other figures done for the other little animals? If not, why only this one? 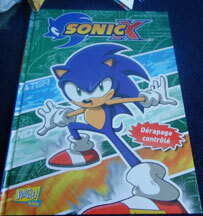 It seems likely, but SonicGear will have to wait on photos. 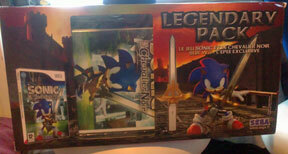 This is the Sonic & Black Knight "Legendary Pack". Sadly, it was only available in France. 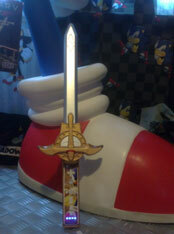 It comes with the wii game, and 2 plastic pieces that you click together to make the Caliburn sword from the game. The Wiimote fits into where the hilt would be. The set does not include the wiimote. Interestingly, the words "Legendary Pack" are in English. Why? Most France items are all written in French. The game name is "Chevalier Noir" (Literally Knight Black") so why write it in 2 parts? The Caliburn you get is nice & big too! Look at the detail, & size compared to the Wiimote. The game would likely be really fun to play with this, it's too bad it wasn't released everywhere. So cool to have a 'prop' from the game, this is likely to be sought-after. Photo & owned by Shadouge. 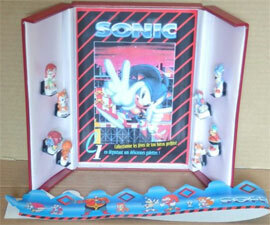 This is the complete set of BN Troc's Fluo Sonic Pog Set. This image is kept especially large so that you can see all the rare, modified & interesting old Sonic art they use for these pogs. The pogs were given away with "Biscuiterie Nantaise". 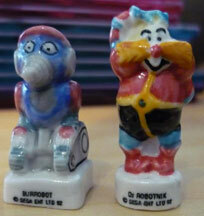 They're copyright around 1992 or so, but that's thought to be earlier than when they were actually made. 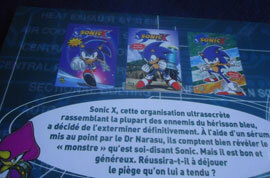 Look at all the different & rarely-seen Sonics. 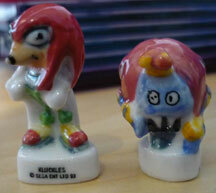 You've got hockey Sonic, Baseball Sonic & Wind Surf Sonic. 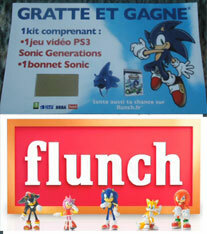 The jumping hands-up one (middle, red background) is modified "football catchin' Sonic" to be without his ball. Forward leaning/pointing Robotnick & running forward slightly mutant Tails (bottom row) are also seldom seen. This is an interesting collection due to the unusual art! Image provided by Milk Cap Mania. This is a close up of one of the above pogs from a set of 30 of them, made for/inside of France. They are by BN Troc's (whatever that means). The FLUO likely indicates that either they glow in the dark, or under black-light (florescent) This is another set of mysteriously notched pogs. Why are they notched? What's with the big notch on one side? They are numbered on the back.